The project is being developed by the prestigious house of Tridel Corporation and is sure to change the Toronto skyline for the better. Located in10, Eva Road, the project boasts of state of the art facilities and its futuristic design is indeed an architectural wonder. 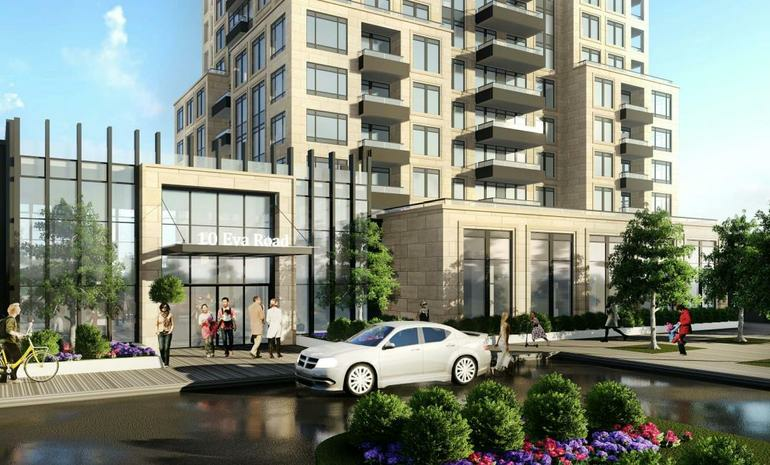 The tower would have 213 units high and it is going to be great building housing sprawling condominiums that is sure to promise a better lifestyle for those living here. The project is going to be 18 storey high and it is going to have a total of 318 units. The development is expected to be completed by 2020 and the sizes of the apartments range from 397 sq feet to 1067 sq feet. There are going to be studio options, as well as one bedroom to three bedroom options. The prices of the units would be disclosed to those who are interested. There are ample parking spaces for both cars and cycles and that make the project especially desirable. The project has a walking score of 91/100 and makes walking very pleasurable. The residents are sure to enjoy a number of amenities here that will change their lives for the better. The project is going to have one of the most technologically advanced security systems. There are spacious lounges and the lobby is great for holding private meetings. The glass ection of the building looks stunning lighted up at night. The terrace offers a great view of the city and almost every apartment unit has a balcony. The bathrooms and the kitchens are fitted with the best ever fixtures and appliances and they are sure to make life easy for all those residing here. The project is situated at the crucial juncture of the city, at Eva Road and it is situated in the greater locality of West Village, an award winning area because of its stunning planning and its access to amenities. The ample open spaces provide great areas for walking and jogging and are especially good for the children. There are a number of other dining areas, shopping malls, banks, schools and colleges located within easy reach of the project. The Tridel Corporation, is one of the most trusted names of real estate in Canada and they have worked relentlessly for over 30 years to give the city the very best of properties. They have built over 200 award winning homes, a record shared by few others. All their apartment buildings have master plans are built as mixed use communities. They have also built a number of commercial and industrial spaces and they are all one better than the other. The project is surrounded by a vast open spaces. The project has an efficient fire fighting system. The project would have state of the art technology for overall security of the building and its complex ground.